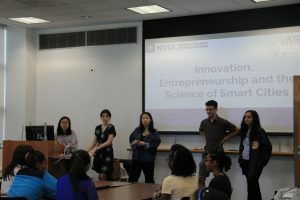 Innovation, Entrepreneurship and the Science of Smart Cities (ieSoSC) is the unique continuation of the SoSC program offered here by the NYU Tandon School of Engineering. Sponsored by National Grid, ieSoSC is meant to be a more advanced course for returning middle and high school students already familiar with Arduinos boards, coding, civil engineering, and other subjects covered in the original Smart Cities curriculum. They continue with advanced concepts using coding and circuitry from the very beginning, deploying technical skills to improve quality of life and to conserve the environment. The skills they developed in public speaking and presentation were also expanded upon, building the confidence needed to effectively instruct others, thoroughly rounding out their capabilities in speaking about public service technology initiatives. 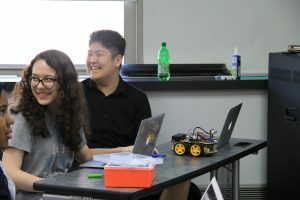 Serving one’s community in a manner suited to the modern world is a difficult task, and the students at ieSoSC required knowledge on the tools they would need to better navigate a tech-dependent age. 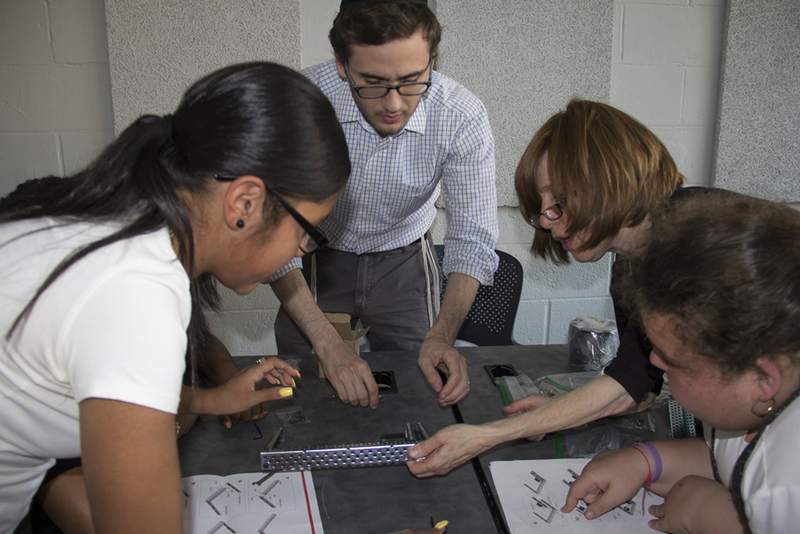 They gathered with Prof. Debra Laefer, a longtime teacher of Civil and Urban Engineering, to learn about the methods used by conservation organizations and local governments to keep track of environmental degradation in a given area. Debra explained that this process is dependent upon the use of LiDAR (light detection ranging), a system which uses aerial infrared lasers to measure elevation. LiDAR can be used to measure the height and density of tree canopies, and so is incredibly useful when it comes to keeping track of forests. Debra then went on to detail the use of LiDAR in detecting architectural damage to buildings, which can be used to repair sections of cities and the planning of new projects (like subway tunnels, etc.). 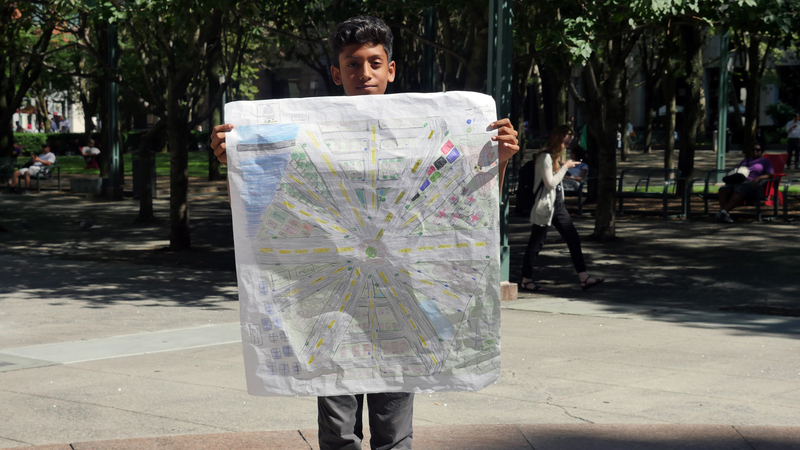 Students discussed the means of producing such accurate measurements of change, techniques which will prove vital to the maintenance of large urban areas in the future. They also used their own variant of the technology used in LiDAR (albeit a much weaker version) to experience firsthand the process of measuring changes in a given area over time. 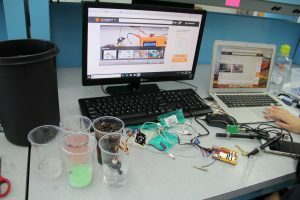 The students continued to learn about matters that will benefit urban life the next day, when they began programming “smart trash cans” that would make the process of waste disposal more efficient. 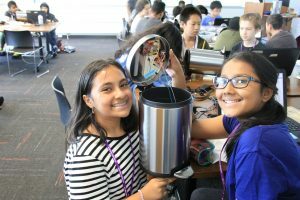 Students were taught how to apply pressure sensors to trash cans, in order to measure both the weight of the objects inside the can, as well as how much pressure they exert on the cans’ sides. They installed ultrasonic sensors inside the cans’ lids, using them to measure the amount of trash in a given bin. The information gathered via these sensors was then transmitted via a cloud service to a dashboard designed by the programmers, allowing them to measure the volume and height of the material in each can in real time. 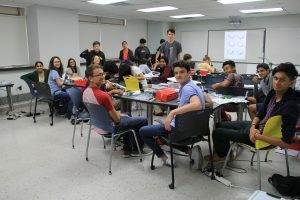 The students crafted everything about the system themselves, wiring the sensors, building the circuits and coding the microcontroller that measures and transmits the pressure and data. 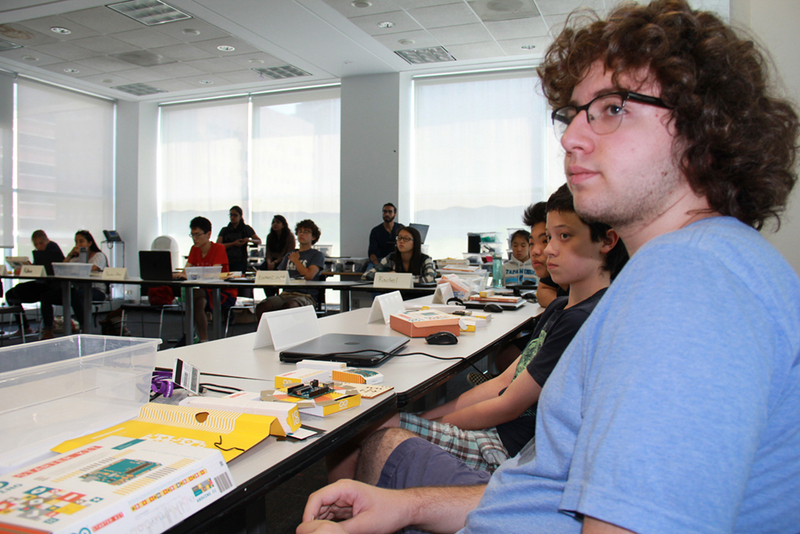 Using the many building blocks established from the Science of Smart Cities, the students of ieSoSC program appear far more equipped and comfortable than the average classroom. Aware and comfortable with both each other and the subjects they’ve tackled thus far, they remain strong in their studies, learning world-changing innovations which they too may innovate some day, for the benefit of humanity. This entry was posted in ieSoSC on July 19, 2018 by Nic. 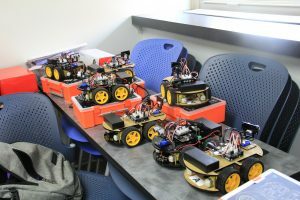 The Summer Program for Automation, Robotics and Coding (SPARC) is a unique tuition-based program offered for the first time during summer 2018. 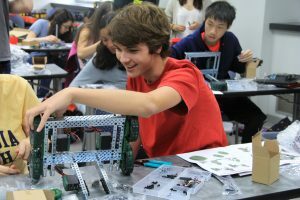 It welcomes high school students with strong passions for STEM, specifically in the realm of robotics. 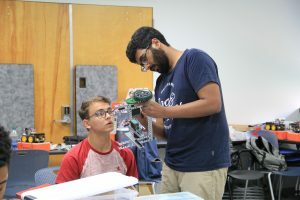 The course lasts two weeks and takes students through the coding and circuitry of basic robotics before leading into some construction and testing. The instructors of SPARC are what truly make it stand out as a STEM program, as the complex construction and coding of robots is transformed in an accessible, casual atmosphere, where learning and question asking are happening constantly. The classes start with a rundown of circuitry and basic electrical engineering fundamentals before progressing into physical breadboards, wiring, and coding. 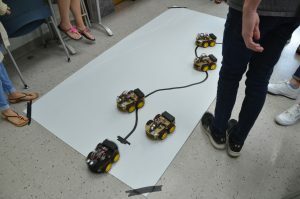 The first robot the group constructed was a four wheeler made of acrylic with rubber tires and was designed to move according to code input through an Arduino microcontroller. Our instructors believe in giving the students the right amount of balance between formal instruction and freedom. For example, while the students understand the basics of constructing the robot and its frame, they are never told where to put their Arduino board and its wires, through which all of the coding directs the device’s movements. For the next robot the group constructed, a type of large claw device, the students were given even less advice, but were still highly adept with the instructions provided, despite the increase in complexity of the new kits. The materials were also upgraded from acrylic to more solid metal and plastic. The instructors are all graduate students whose studies are either Mechatronics or Mechanical Engineering, well experienced in the devices used in the program and the fundamentals behind their abilities. Items such as microcontrollers, interface sensors, and actuators were all explained and treated with care. Shivam Bhardwaj explains his philosophy of embracing the missteps of the students. 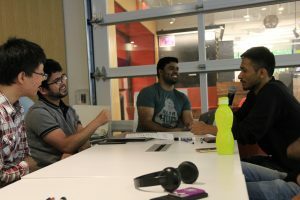 He acknowledges, “No one can become an engineer in ten days, but we put them on the right path, and they’re interested, they’re engaged.” Shivam allows flawed code to be uploaded on purpose, to enable the students to problem solve it proactively as engineers would, so that everyone learns and progresses together. Maintaining interest is a key focus for the instructors, and their approach is very nuanced. Shivam explained that he starts the students off with interesting things, such as sensors, to pull them in. One such device is a proximity sensor that measures distance; it’s the same type of technology included in the Roomba (as one example). The lessons conclude with more difficult tasks, such as conducting proper wiring. Shivam explains, if one aspect of the numerous wiring ports is not perfect, the program will not work. Ending with this is important because it allows the students to gain confidence in their abilities and interest from the material they enjoy early on; they’re far less likely to give up despite the increased difficulty of their final tasks. Having an inclusive atmosphere is also very important to the instructors and course. Alberta Kove, a Masters Mechanical Engineering student, reminds students that workers in STEM, not the most diverse of fields, don’t have a mold, and anyone with enough interest is capable of reaching their full potential. With the program’s innovative, hands on, teaching style alongside its advanced and intricate robot kits, SPARC promises to be a program with incredible potential and nuance for high school students from all backgrounds. This entry was posted in SPARC on July 18, 2018 by Nic. The SoSC program has officially begun! 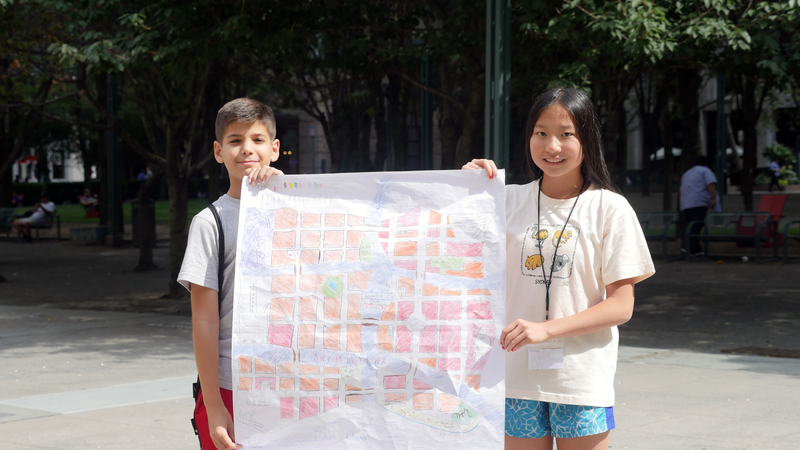 Lead by our fantastic NYU Tandon students, middle schoolers from around NYC study and build the technology that many of our cities will use in the future. The objective of smart cities is to ensure a more liveable, efficient, and connected environment for urban life in the future. Teaching these concepts at a young age helps prepare the next generation for the impact of these technologies, as well as their own academic studies, leading to a beneficial future in which both scientists and their communities thrive. Another important benefit of the SoSC program is the addition of training to help the students become better public speakers, courtesy of the Irondale Theater here in Brooklyn, with 10 total hours of training throughout the duration of the program. At the start of the program, expressive games and speaking exercises introduced the students’ personalities and fostered early dialogue between them in a fun and comfortable way. 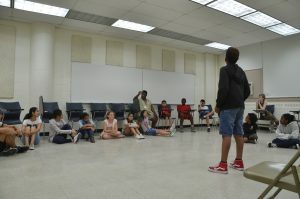 The theatre training is scheduled in between classes through the duration of the month-long program to strengthen the student’s presentation and speaking skills as well as improve their comfort in conveying information with peers, specifically with STEM-related knowledgee. There are many examples of how the things students in the SoSC labs learn will one day benefit entire populations. Ben Esner, K12 STEM Director, cited the study of Smart Cars in the SoSC program going years back, emphasizing that today they are more common than ever. In the coming weeks, students will be learning skills like coding, circuitry, and other skills in the field of smart tech, preparing them to create the innovations of the future. The combination of this newer type of study alongside basic civil engineering is the core of what Smart Cities are all about. 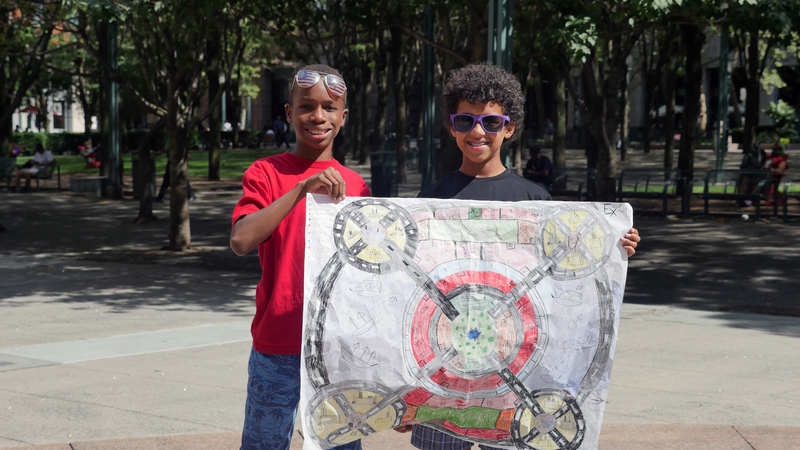 Before they could begin their studies of smart cities, however, they needed to learn the basics of how existing cities function, in order to blend these existing concepts with smart technology later on. 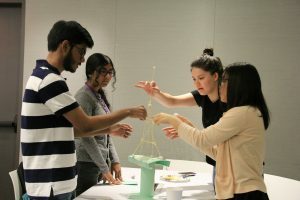 In their first week, students of SoSC studied topics like water filtration and PH measurement, as well as the analysis of solar data, to understand the techniques employed by civil engineers in building infrastructure for large populations. All of the students were very eager to learn, build, and work diligently to come up with ways their findings could be applied to improve the systems which cater to the needs of the community. Students started out by performing a water syphoning activity, where they learned about water pressure and the importance of water conservation. The students also performed a water filtration activity in which they used paper filters and varying types of sediments to see which filtered water the best. They then performed a PH activity to test the acidity or basicity or certain substances. This taught them a valuable method of testing the purity of water, which they applied to their knowledge of filtration and impurity detection to better assess how communities might improve regulating and cleaning their water. To end the busy week, students constructed towers made out of balsa wood, glue, and tape to measure their strength, height, width, and cost efficiency. Adding the concept of cost when it came to their materials was essential because it made the activity more realistic, and added the consideration of practicality and efficiency which is pivotal to great engineering. The first week culminated in the Great Balsa Wood Competition in which all the SoSC classes squared off against each other, determining which tower design could bear the most weight. It was a fitting send off for a week full of energy, engineering, and ingenuity. This entry was posted in Science of Smart Cities on July 18, 2018 by Nic. Recently, the young participants in the ARISE program arrived for orientation, an opening meant to prepare them for the work they’ll be performing for the next seven weeks. 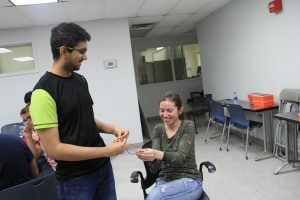 All of the various lab groups which will be participating in the program were treated to fun events that encouraged them to get to know one another and foster their problem solving abilities. Students were also instructed in important protocols required during experiments, such as the proper use of equipment and the storage of materials. Safety was emphasized as the most important aspect of experimentation, and no amount of fun undercut the advice vital to the future conduct of the students. As the day went on, each group split up, depending on the particular lab courses they were taking. 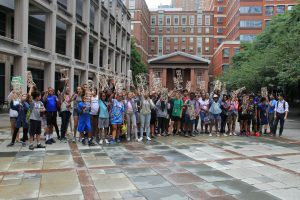 All of the groups, however, received the same lessons on various topics such as academic writing and the Dimensions of Scientific Inquiry (DSI), instructed Dr. Brendan Matz and Dr. Leah Aronowsky. Dr. Matz co-created DSI with Ben Esner, K12 STEM Director, as a 25 hour course blending science, ethics, writing and history into one course for high school students. The course is intended to expand kids’ views of science, infusing it with more social and ethical themes in addition to history in order to give them greater societal context when it comes to their writing and understanding of STEM. “Essays take time and effort,” Matz said to his students. “College professors, when reviewing your application, want evidence of your achievements that isn’t reflected elsewhere in your portfolio.” Matz was determined to explain the full versatility and applicability of academic writing skills, breaking down the process of writing essays into basic steps to reveal the surprising simplicity of the seemingly complex practice. Further resources for studying and practice were given online, ensuring that the students who attend STEM this summer will have the tools they need for the program and the future search for colleges. Dr. Matz worked with Dr. Aronowsky (albeit in separate groups) to teach their students how best to operate in the world of professional science in a manner that also respected the social world. Dr. Aronowsky also taught them of how, over the course of recorded history, science came to resemble what we know today, engaging in conversations with them to gauge their comprehension of the subject. She laid out the basics of the scientific method for those students who were unfamiliar, and described to them the differences between true science from pseudoscience. 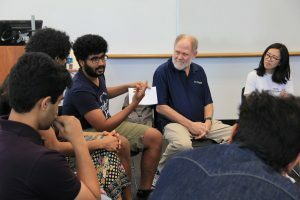 With these topics in mind, the students were well-equipped to begin their studies, meeting with graduates of the school and professors to discuss specific experiments that pertained to their lab focuses. They learned about the application of engineering to other fields of scientific research, and how they could use this ability to apply one subject to another for the benefit of the whole. In this manner, they became aware of how to maintain both moral standing and scientific accuracy, keeping the precarious relationship between ethical norms and objective reasoning perfectly balanced. Leaving each of these classes, it seemed that the young members of the ARISE program left with greater understanding of how the effects of scientific discourse permeate every aspect of their lives, from both the standpoint of larger populations as well as that of the individual. This knowledge is one of the most crucial factors in the way we conduct ourselves in the field of research; it is only with an understanding and respect for the intricacies of the sciences and the way they influence the world around us that we’re able to responsibly pursue knowledge and disseminate it. 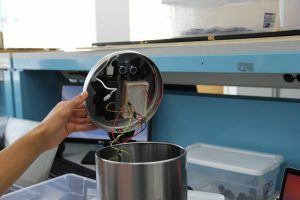 With the ability to now operate both efficiently and ethically, they have the freedom to research and experiment on the subjects which they find interesting, prepared to take the steps needed to ensure their safety, the accuracy of the tests they conduct, and the fulfillment of their own ambitions on the scientific stage. This entry was posted in ARISE on July 10, 2018 by Nic. 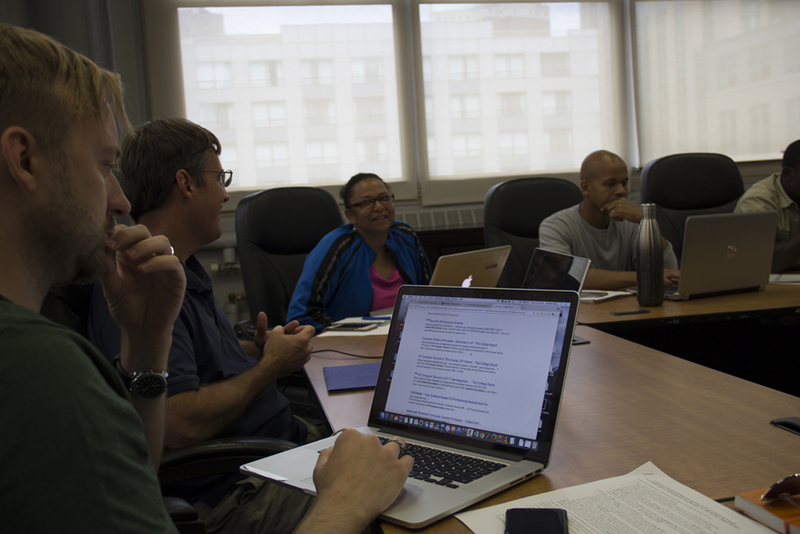 This week marked the final preparations for K12 program leaders before the arrival of their students in July. 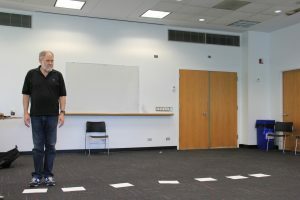 The instructors worked closely with Irondale Theater leader and actor Terry Greiss to hone their skills in presenting for large audiences, condensing information, and connecting with one another. Over the three day period, Greiss led the instructors through a number of exercises meant to introduce them to one another and begin warming up their skills in expression. Activities ranged from simple exercises such as relating their science to a classmate’s hobby, and pitching fictional products, to more emotional exercises such as describing their favorite picture using a blank sheet of paper or telling their own personal stories with science. This is especially important when many of the concepts instructors will teach may be complex and directed towards a younger audience. The first day was mostly focused on introductions and loosening up: “Do you remember each others’ names better?” Greiss said after one particular exercise, in which the instructors were required as a group to introduce themselves by accompanying it with a gesture and profession of their favorite subject. “Why do you think that is? It’s because you associate things with each of them. It’s not enough to simply hear a name once; when you picture something in accordance with it, it’s easier to ingrain that information in your head.” Most important to Terry was how well each of the instructors were able remember each other, and he stressed time and time again the necessity of retaining personal information about one’s associates in order to maximize the efficiency of academic interactions. The second day was mostly based around storytelling and communication: in one activity, students applied a storytelling structure to their sciences, speaking first in pairs and then to the entire group. According to Greiss, this shows how presenting to large groups can be made easier by getting to know individuals first, building greater trust and allowing for an easier time conveying information. To create a more collaborative and quick-thinking environment, students were brought up in groups of five, tasked with telling a story, in which one member says a portion of it, followed by another member quickly adding to it. For the final day, enthusiasm and empathy were the main themes. In a pairs, students ranted for a minute to each other about something they were passionately angry about. Then, in a group, they each described the good attributes and qualities of their partners despite the negativity of their rants. This illustrated the concept of empathy and understanding for others, even if they aren’t at their best. 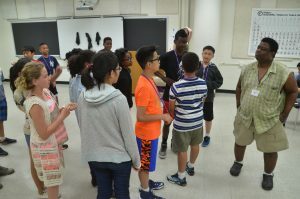 To practice enthusiasm, students were divided into large groups and given two random objects which they were tasked with feverishly pitching like an infomercial. This was a conductive exercise not just for working in groups, but for providing convincing information and showing fast-thinking enthusiasm and creativity. The creative application of social interactions to explaining science and engineering concepts is key to an effective education, as well as collaborative efficiency. With their skills in these matters revitalized, the Instructors for the K12 STEM program are ready to tackle the task of bolstering the knowledge of those younger than them, promising a successful experience this summer. Follow the K12 Center on Facebook and Twitter for more updates! This entry was posted in Uncategorized on June 29, 2018 by Nic. 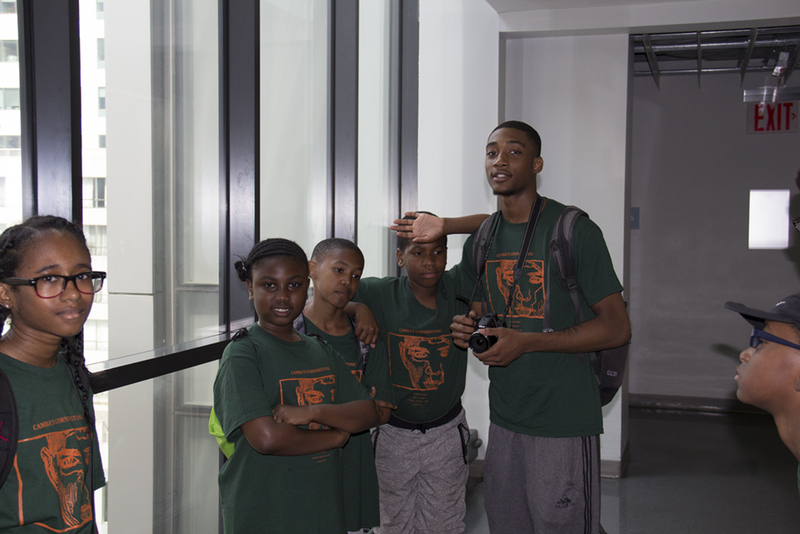 June 11th marked the first day of preparation before the Center’s summer programs begins at NYU Tandon. 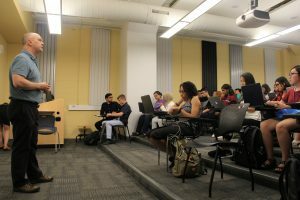 During the last two weeks our instructional teams, made up of current (or recent) undergraduate and graduate NYU students in engineering and computer science majors, are meeting to plan their courses and activities for the summer. 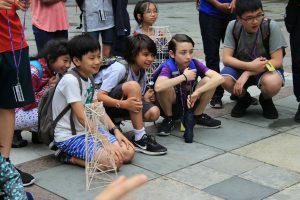 The programs’ goal is to introduce high quality STEM education to middle and high students and teachers from all around New York City’s boroughs, who may not have the opportunities otherwise. Preparation for the summer has differed from group to group, depending on their course objectives. 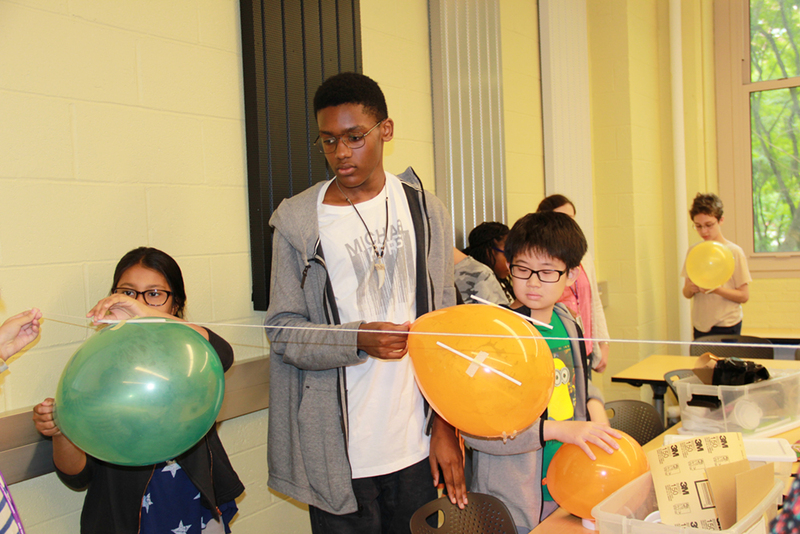 In Science of Smart Cities (SoSC), instructors, co-lead by graduate Integrated Digital Media student Jason Charles, worked together to create a water syphoning activity using straws and cups to illustrate methods of water conservation. The day after, the instructors focused on another civil engineering based activity, in which structures made of sticks of balsa wood were evaluated and judged based on their ability to withstand force. 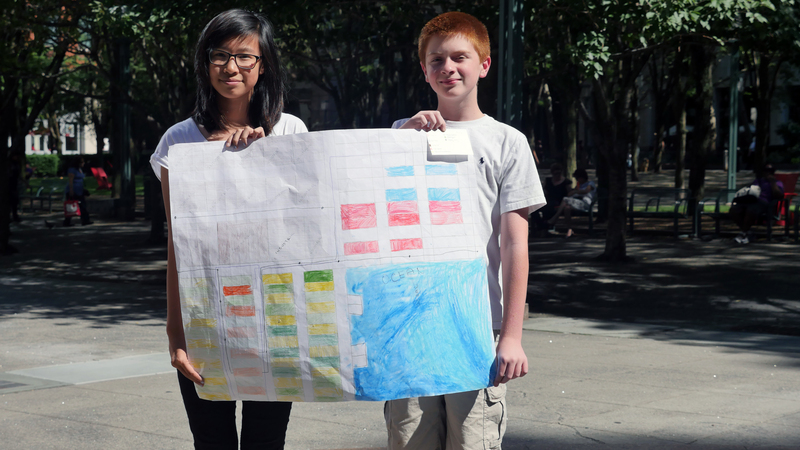 ieSoSC, an offshoot of SoSC, has also been working on applying engineering and technology to urban life and cities. 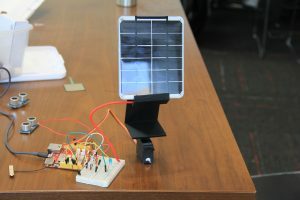 Lead by PhD students Ana Elisa Mendez and Yu Wang, their team’s notable activities include a device which measures the purity of water using sensors and circuits, as well as a trash can that uses a Seeeduino circuit board and Wifi to alert users when it is full and in need of replacement. 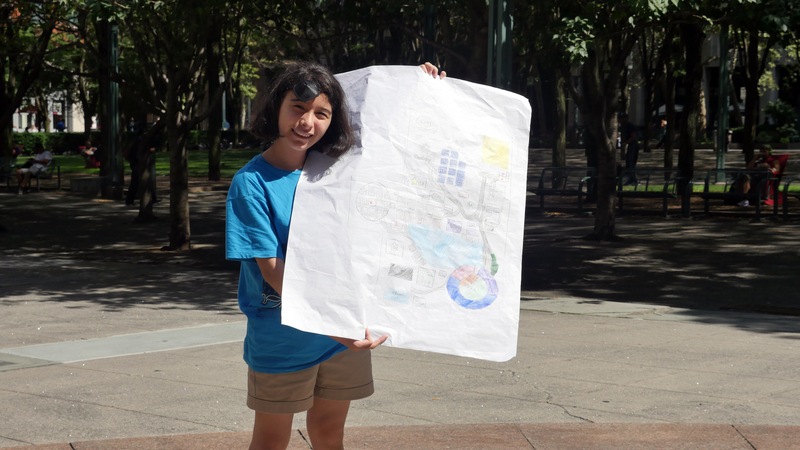 These activities for students are designed to demonstrate practical examples of smart city technologies that use microcontrollers, sensing, and cloud computing for every day applications. Another program coming to life is Creativity in Engineering, Science, and Technology (CrEST), where the focus so far has been on making Arduino circuit boards fun and easy to understand for kids. 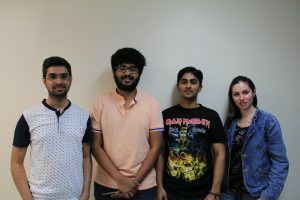 During the academic year, CrEST is taught to high school students who then intern at Tandon, under the supervision of our own students, and go on to teach one week workshops to middle school students. The robot Karen holds above is a vibrating battery, connected to an on/off switch. Once the circuits are arranged correctly, the device vibrated the cup with markers attached, which then drew colored paths on paper as the device ran. Outside of building and experimenting with curriculum, all our student instructors also spent a day working together to ensure their classrooms are as inclusive and learning-friendly as possible. 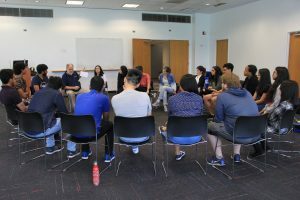 In a session designed and led by Dr. Sheila Borges and Katherine Salamone, the Center’s Assistant Director and Projects Manager respectively, instructors completed activities together as well as ran through various trainings and culturally relevant pedagogy. 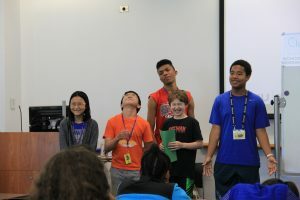 In these, instructors created their own class rules, solved hypothetical situations through dialogue, learned essential protocols, and took bias training to ensure classrooms were as inclusive and participatory as possible. Here, instructors came away with a greater sense of community with one another and took the next major step towards leading the summer programs. In the next week, this prep will be expanded with the help of folks from the Irondale theatre in Brooklyn. 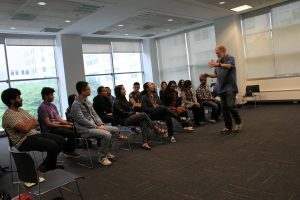 During these sessions, the groups will participate in improvisation training to inspire the instructors and provide them with helpful presentation and public speaking skills for teaching. 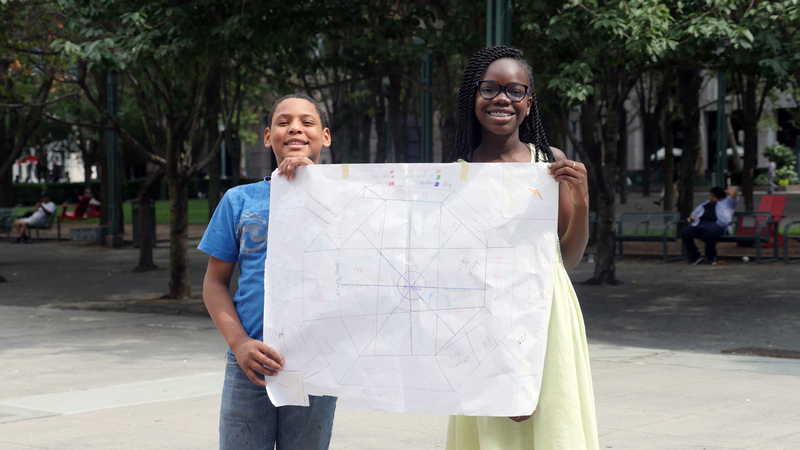 Summer 2018 is gearing up to be the most significant season in the Center’s history, with goals aimed towards expansion, inclusion, and providing the best possible STEM education for NYC’s young people. For more updates on the programs, activities, and people, follow the center on Twitter and Facebook! This entry was posted in ARISE, Science of Smart Cities on June 22, 2018 by Nic. 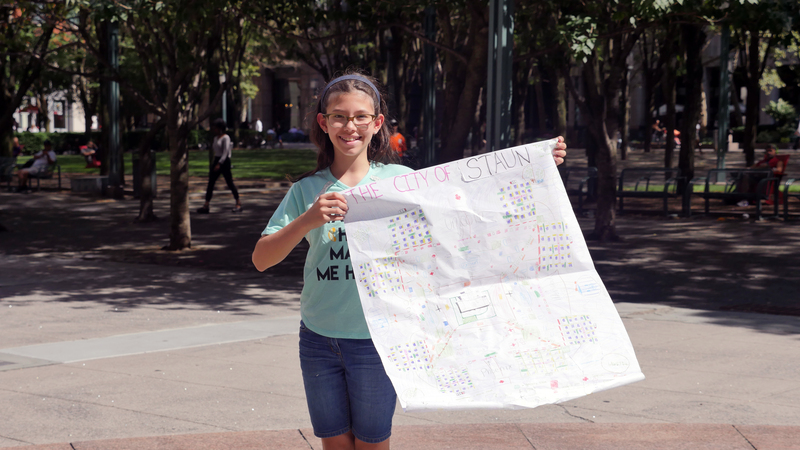 Last week marked the official beginning of #SUMMEROFSTEM. 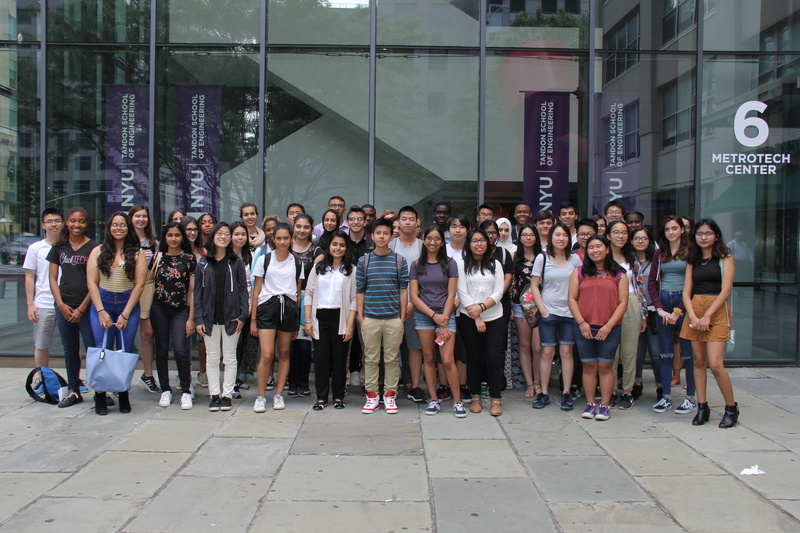 Nearly 300 students and 50 educators arrived at NYU Tandon School of Engineering, participating in over half a dozen programs committed providing opportunities to middle school and high school students to gain intensive and hands on experience in science, technology, engineering and math. Beginning today, students will also be venturing to labs across NYU, conducting research alongside faculty members and graduate students. This year, we’re proud to announce 59% of our applicant pool were girls whereas the other 41% were boys. The high school program ARISE boasts the highest girl demographic among all our programs behind CS4CS, formerly known as GenCy, our all girls’ program. This summer, instructors, Leah Aranowsky and Brendan Matz lead the effort for ARISE before they head into participating NYU faculty labs, including the Soil Mechanics, Center for Music and Audio Research, Composite Materials and Mechanics, Mechatronics, Applied Dynamics and Optimization, Dynamical Systems, Biomolecular Engineering, Bio-Interfacial Engineering and Diagnostics, Developmental Genomics, Systems and Proteomics and Molecular Anthropology Labs. 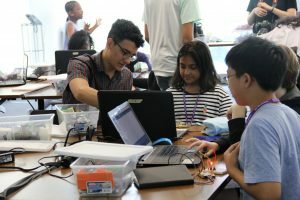 Returning this year as well, CrEST, Creativity in Engineering, Science and Technology, targets middle school students plan to introduce concepts ranging from wireless cars to vibrating bugs, circuits, and introduction to wireless internet. This summer also marks the launch of ieSoSC, an offshoot of SoSC, Science of Smart Cities. Students who have previously participated in the SoSC, Science of Smart Cities are given the opportunity to return and continue the practice of building sustainable urban infrastructure through the lens of innovation and entrepreneurship. 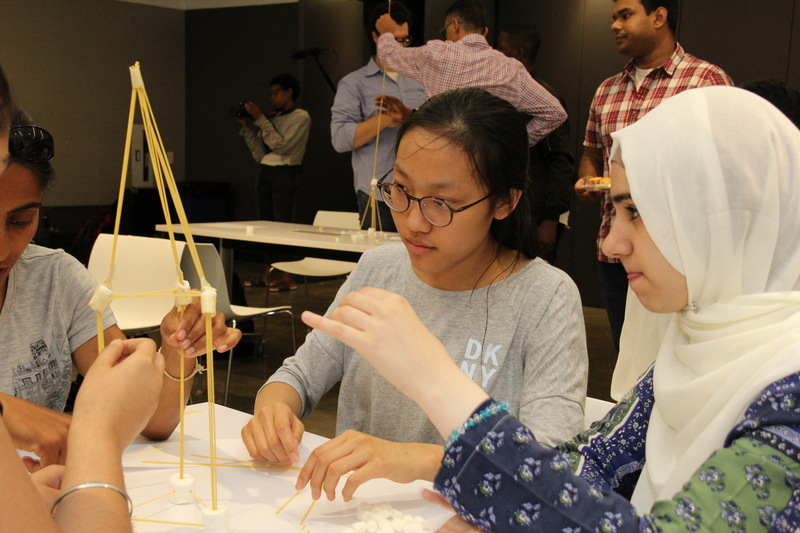 Finally, in addition to our student programs, educators committed to implementing concepts and topics in STEM are welcomed on campus this summer. NYU Tandon’s Professor Vikram Kapila continues to lead the direction of RET, DRK12 as well as iTEST which was designed and developed to allow educators and students to grapple with themes in science and technology in a collaborative environment with their students from their respective schools. 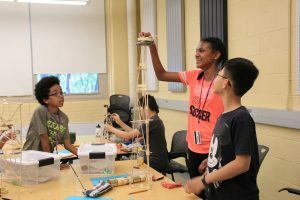 Follow us for a #SUMMEROFSTEM and special thanks to our supporters– The National Science Foundation, Siegel Family Foundation, The Sloan Foundation, BHS/STEAM Center Schools, National Grid, ConEdison Northrop Grumman, Pinkerton Foundation, DTCC and ExpandED Options. 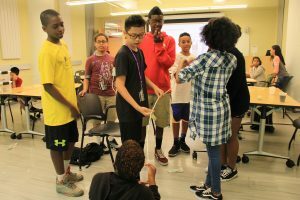 This entry was posted in ARISE, Central Brooklyn STEM Initiative (GK12 Project), Cybersecurity Programs, DRK-12, K12 STEM Lab, Uncategorized on July 17, 2017 by NYUk12 stem. 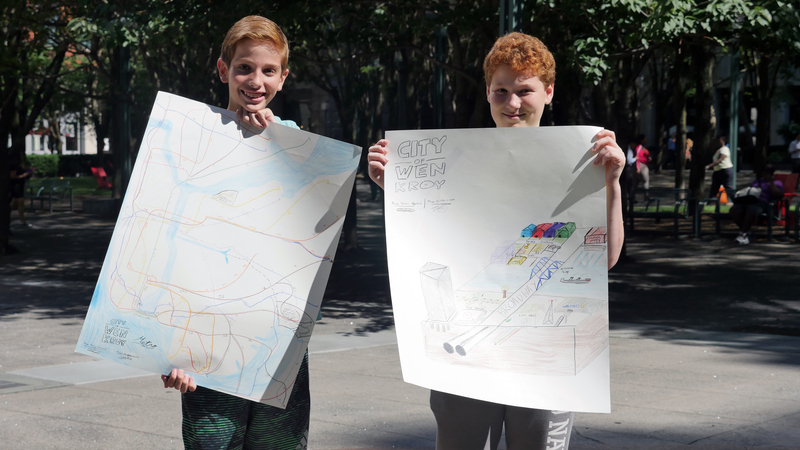 Our Science of Smart Cities (SoSC) middle school students used post-it easel paper, rulers, pencil crayons, wire, hot glue and a LOT of imagination to plan and portray their ideal city layouts, one of the many hands-on activities that they complete during the month-long NYU Tandon School of Engineering’s Center for K12 STEM Education program. 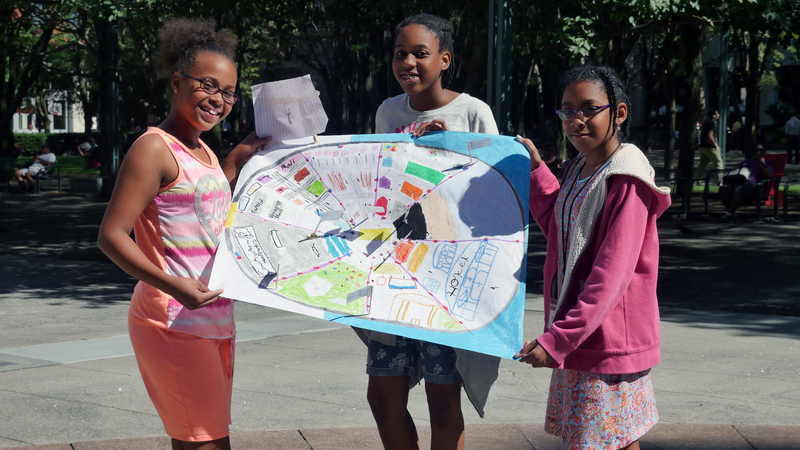 The students put their ongoing education on engineering, technology, sustainability and environmental issues to work and created more than 30 city layouts of all shapes and sizes, including transit systems, renewable energy, and in one case, a giant hamster wheel to power the city! 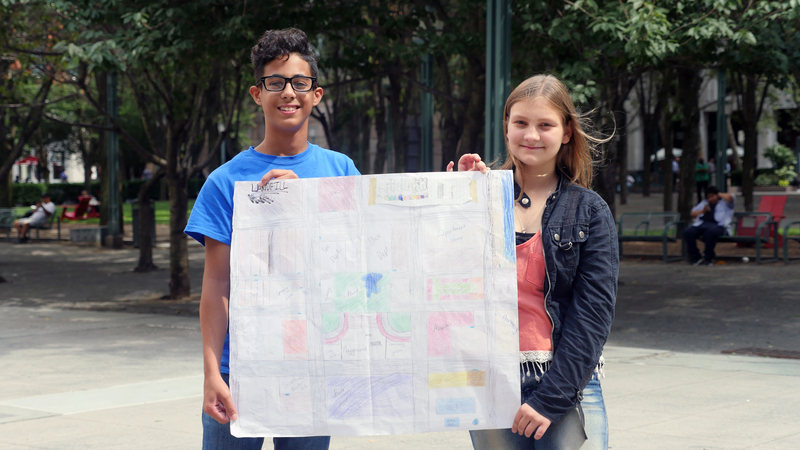 Scroll down to see some of our best SoSC 2016 smart city designs (click on the photos for a closer look) and read quotes from our promising city planners-to-be. This entry was posted in Uncategorized on July 22, 2016 by karissa. 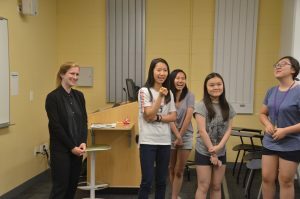 Last week, students in our FREE, three-week, full-day GenCyber Computer Science for Cyber Security (CS4CS) Summer Program for High School Women discovered “Leonardo DiHatrio’s” stolen Oscar at the NYU Tandon School of Engineering, along with a Caesar cipher-encoded note. Was the crime committed by “Mark Puckerberg,” the queen, or another culprit? The young women set off on a camp-long mystery challenge to find out. Watch part one of our two-part web series to see how they use ‪their new cybersecurity‬ and computer science skills, like Autopsy to recover a deleted file, to determine who thieved the Academy Award. 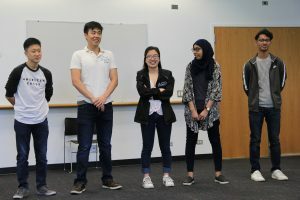 Ultimately, they’ll use skills learned during CS4CS to compete in the nation-wide Cyber Security Awareness Week annual High School Forensics Challenge along with team members from their high school. The GenCyber CS4CS Program is generously funded by the National Science Foundation and National Security Agency. To learn more about the course content, check out a post on the program in our #STEMNOW blog and a sample syllabus. GenCyber Mystery Challenge – Part 1 from Center for K12 STEM Education on Vimeo. This entry was posted in Uncategorized on July 15, 2016 by karissa. If you follow us on Facebook and Twitter, you know we shifted into high gear this week with the start of Applied Research Innovations in Science and Engineering, GenCyber and Science of Smart Cities. It’s been an amazing week, with Expanded Schools interns teaching circuitry to our diverse group of ARISE students, GenCyber starting cybersleuth work on a camp-long mystery, and SoSC learning skills that range from the art of giving presentations to the science of building LED circuits. This entry was posted in Uncategorized on July 8, 2016 by karissa.